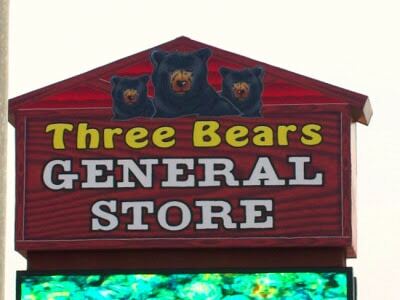 Established in 1979, Three Bears General Store is a true Pigeon Forge destination. Located at the foothills of the Great Smoky Mountains National Park, our 40,000 square feet store is a shopper’s paradise! Nestled inside, you will find our Make-UR-Bear Factory complete with outfits and accessories, a family-sized arcade packed full of fun and our very own 7 scene Ol’ Tyme Photo studio where you can jump on a Harley or sit a spell on our “Hillbilly” porch. We strive to provide excellent “southern hospitality” along with a wide variety of quality products. From Amish jams and jellies to “moonshine water” and handmade fudge to over 555 Great Smoky Mountain souvenirs, you’re sure to find exactly what you’re looking for! Operation Seasons – Open year round 7 days a week.